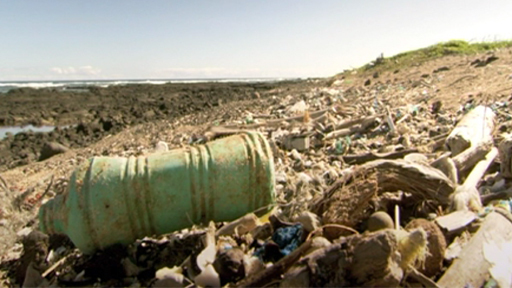 Consumer waste from the "Great Pacific Garbage Patch" is turning a Hawaiian beach "into plastic", Tropic of Cancer presenter Simon Reeve has found. Conservationist Sam Gon escorted him to the remote Kamilo Beach on Hawaii, where plastic bottles, bags, tyres, rusting petrol cans, and other waste from around the world washes up. They found more plastic particles than sand, as they dug a hole on what has been described as "the world's dirtiest beach". Tropic of Cancer - Laos to Hawaii is on Sunday 25 April, 2000 BST, BBC Two.